Explanation: Venus, the second closest planet to the Sun, is a popular way-point for spacecraft headed for the gas giant planets in the outer reaches of the solar system. Why visit Venus first? Using a " gravity assist " maneuver, spacecraft can swing by planets and gain energy during their brief encounter saving fuel for use at the end of their long interplanetary voyage. 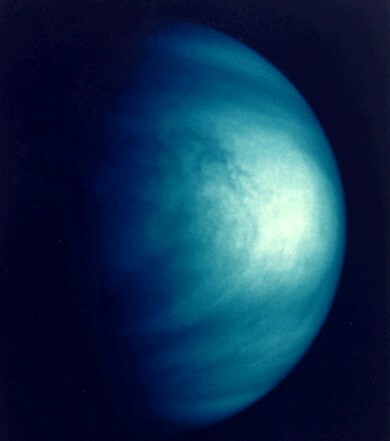 This colorized image of Venus was recorded by the Jupiter-bound Galileo spacecraft shortly after its gravity assist flyby of Venus in February of 1990. Galileo's glimpse of the veiled planet shows structure in swirling sulfuric acid clouds. The bright area is sunlight glinting off the upper cloud deck. The Saturn-bound Cassini spacecraft will complete its own second flyby of Venus on June 24th. Launched in October of 1997, Cassini should reach Saturn in July 2004.